(Newser) – Democratic Rep. Alan Grayson has been relatively uncontroversial for at least five minutes now, so this week became time to discuss his distaste for the Tea Party in an email to supporters: The movement, he says in a transcribed interview with Al Sharpton, "is no more popular than the Klan." 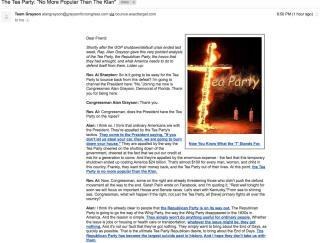 The email is illustrated with a burning cross that acts as the "T" in "Tea Party." Clicking on the image brings readers to a Grayson fundraising page, Politico notes. As for the GOP, Grayson calls it "the largest suicide pact in history" that intends to "bring about the End of Days as quickly as possible," the National Review reports. You're not helping the divisiveness and hyperbole in politics today, Grayson. Stupid move. Why is it that everyone in a political discourse here starts bandying about and brandishing the racist word? Could it be that we all are or could be (if background, experiences, or circumstances dictated) racists, or more accurately xeonophobes, in the sense that over evolutionary time we responded (at least on a subconscious level) out of fear as a survival mechanism to groups that appeared or acted or spoke differently from our own tribe or culture or clan? I am NOT speaking eugenics here by claiming that any one group is "better than another". I am merely stating that to recognize this possibility in all of us, and then to CHOOSE to focus more on our similarities (we are all essentially related). In a genetic sense we are ALL family. Compare your genes to any other human beings and they will be about 99.9 percent the same!). Throwing the "r" word out as a label, does that do anything rationally to prove your point as to political parties? I'd like to treat each person in a political party on their own merits, beliefs, voting record. I think that it really is MORE about a "divide and conquer" strategy to create an "us vs.them" mentality.